Being involved in and caring about pro-choice activism sometimes feels gauche and illicit. It feels, ironically, unfeminine. I have often feared for my safety. As such, I don’t generally put my activism, through which I’ve learned and developed many desirable work skills, on my CV, to prevent possible discrimination. And while it’s such a big part of my life — how I spend my time, with whom I spend it, and how I think about the world in general — I don’t often mention it to people I’ve just met unless I’m sure that they are pro-choice. This is all kind of incongruous because part of the work I do revolves around de-stigmatising abortion. You’d think I’d practice what I preach. And I do…but not always. To me, this illustrates the power of the patriarchal claim over women’s bodies and behaviour. Fighting for the most basic right, control over your own body, should be just one of those things we all agree is important. Except, it’s not one of those things. Even just the word sounds so…harsh and impolite. Abortion. It’s not pretty and soft like the words meadow or lingerie. And when we talk about it too much, even our pro-choice friends start to hide us from their facebook feeds. When we talk about our own experiences with abortion, even our friends and comrades who’ve also had abortions sometimes take offense when our experiences don’t align with theirs. Even when we share our stories amongst ourselves in speak-outs, or through anonymous forums like the Share Your Abortion Story Project, it feels illicit. It feels like we’re saying something about ourselves. Something unsavoury if it must be discussed in closed and anonymous spaces. But here’s the funny thing I have come to realise: Having had an abortion doesn’t actually say very much about a person. The circumstances and demographics of people who have abortions vary so widely that it’s very difficult to make reliable assumptions about them based on the one fact: that they terminated a pregnancy. Yet people make these assumptions all the time. About others and about themselves. Their assumptions are empowered by the overwhelming silence caused by abortion stigma. 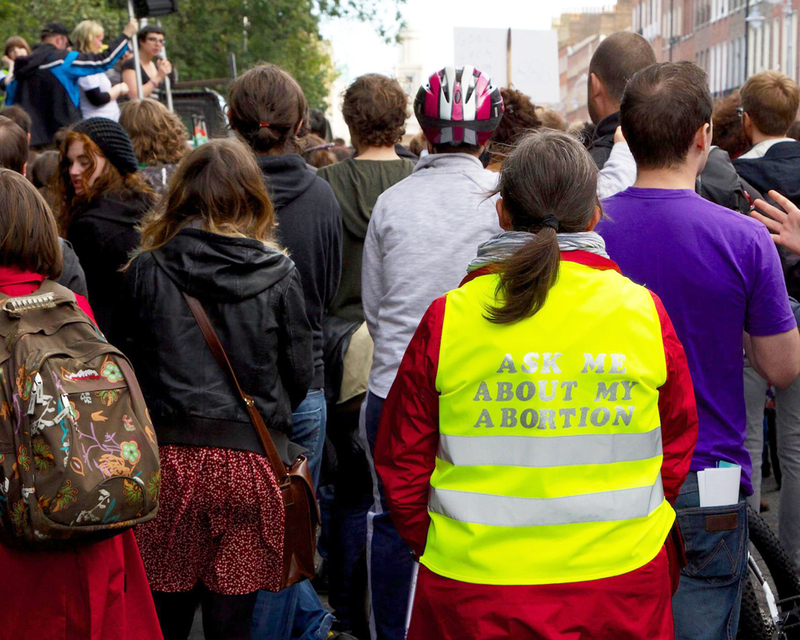 At the first Dublin March for Choice, I emblazoned the back of a high vis vest with the words, “Ask me about my abortion.” It was a rhetorical request, of course, but I was amazed at how many men took it as an invitation to tell me their views on abortion. It’s amazing how often women have to hear everyone else’s opinions on what they do with their bodies, but how few people want to hear about what the experience of choosing abortion is like. Those of us willing to talk about it bear a lot of responsibility that way. We few are the default spokespeople for the millions. And it’s a lot of pressure. I agree with Katha Pollitt that it’s time to reframe the discourse into something more positive. But in the same way that I was told, “Good things come in small packages,” as the shortest girl in my class, it can be challenging to put a positive spin on it. But that’s a challenge worth taking. Because there are more of us than there are of them. If only we’d come out of hiding. If more and more people jettison their fears and begin to speak about abortion as the commonplace reality that it is, then more and more people would understand that their assumptions about what abortion means or says about the people who choose it aren’t readily applicable. Through my abortion stigma-busting work, I’ve been amazed at how empowering the experience of sharing abortion stories has been for the people participating. And how liberating. Silence never got women anywhere. It’s time to talk about all the different types of abortions: the ones that were hard, the ones that were a relief, the ones where we kept our sense of humour, the ones that we thought would break us, the ones that went smoothly, and the ones that didn’t. Generally speaking, women need to be telling their stories – all of their stories. And abortion experiences are simply one type of story that so many of us have to tell. So recently, I’ve come to an important decision. I’m not going to sweep my reproductive rights work under the rug anymore. I’m going to put it on my CV, and when employers ask me about relevant work experience, I’m going to openly discuss my work with the Abortion Rights Campaign. After six years of job hunting in Ireland, leaving it off sure hasn’t gotten me anywhere. And with the invention of google, I assume they will figure it out anyways. So I may as well embrace it. Because it turned out that good things do come in small packages, and perhaps by empowering ourselves to speak and support one another we can change public perception of what being pro-choice is, too.